This is a clean-out-your-cupboard or hit-up-the-bulk-bins or everything-but-the-kitchen-sink kinda cookie. I threw it all in and went a bit crazy. From the sliced almonds to the three kinds of seeds to the cacao nibs, this cookie has an incredible chewy, crunchy texture that can’t be beat. I expect the mix-ins are versatile, so feel free to play around with the nuts and seeds if you’d like. Despite the lengthy dry ingredient list, they are a breeze to throw together. Plus, how hard is it to throw seeds into a bowl? I rest my case. We are doing this for the cookie! Just a quick housekeeping note: I’m using a new recipe card display (below) that Eric created for the site. However, I just noticed that the recipe is not showing up in my feed. This will hopefully be fixed soon, so not to worry! Welcome to my dream cookie. Ram packed with healthy ingredients, chewy, crispy around the edges, thick and bite-sized, with dark chocolate sprinkled throughout. One thing to point out. I used a very "drippy" raw almond butter in this recipe. 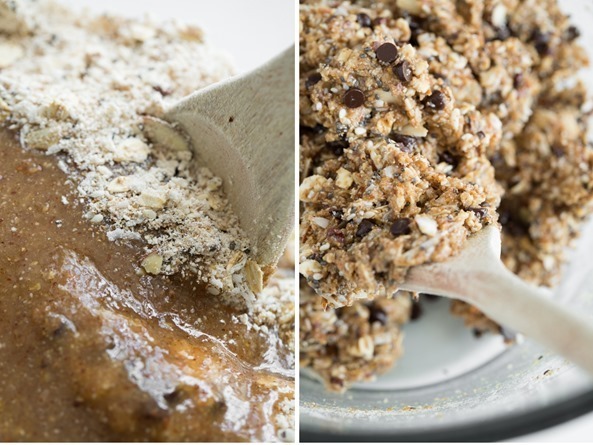 If you are using a more solid & thick and less liquid-y nut butter, you may want to add another 1/2-1 tablespoon of water into your flax egg to prevent the batter from becoming too dry. I did make a version with a traditional flax egg using 1 tbsp ground flax and 3 tbsp water, but the cookies spread out too much and were quite thin. So by reducing the flax egg to 2 tbsp water, it produced a much thicker cookie. As you can see, small changes in the consistency of the batter will produce greatly different outcomes so keep this in mind when experimenting! Portion small balls of dough (just smaller than golf balls) onto the baking sheet, spacing them a couple inches apart. I ended up baking two trays of cookies because I didn't know how much they were going to spread out. Bake cookies for 13-15 minutes (I baked for a full 15 minutes), until light golden brown on the bottom. Cool on the baking sheet for 5 minutes before transferring to a cooling rack until completely cool. The cookies will break apart easily until cooled, so be careful. Notes: 1) For a completely gluten-free cookie, be sure to use certified gluten-free rolled oats and to check all other ingredient labels. 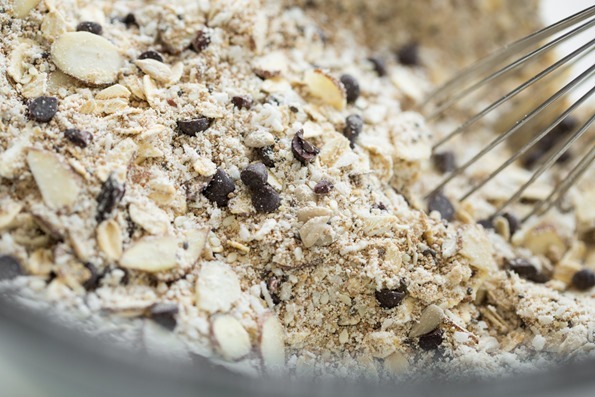 2) To make oat flour: Add 1 cup of rolled oats into a high speed blender and process on high until a flour forms. 3) To make almond meal, add a scant 1/2 cup of almonds into a high speed blender and blend on high until a fine meal forms. Break up clumps with your fingers and measure as normal. 4) The raw almond butter I used was very drippy, so be sure to use a drippy, all-natural nut butter if possible. Soooooo, I’m basically looking for another excuse to make these cookies again real soon and I’m wondering if there is a demand for a totally nut-free version of this cookie? If so, let me know in the comments and I will try to come up with a nut-free version. It would be great to have the kiddos bring these to school. I think some schools are peanut-free while others are totally nut-free these days. What about sesame? Is that a no-no too? Fill me in, I’m outta the loop. Also, you may have noticed that we have a new snazzy looking recipe display up there. That’s thanks to Eric’s handy programming work. If you notice any problems or encounter any issues with the print or email function, please let us know. We’re also hoping to get a recipe rating feature at some point too. You could probably make them using ground up sunflower seeds or pumpkin seeds instead of almond meal and sunflower seed butter in place of almond butter. I don’t have a sensitivity to nuts, but now I’m curious to see if these cookies could be nut-free. Maybe I’ll give it a try. I made them with sunflower butter, pumpkin seed meal, subbed the sesame with whole flax seeds and used pumpkin seeds and extra sunflower seeds for the almonds and they came out great…just a little green from the pumpkin seed meal. I also made a batch with hemp seeds in place of the sesame and those were good too. YAY! This recipe is literally an answer to prayer (and I have all the ingredients on hand except cacao nibs) – our family is on the Body Ecology diet, so going nut-free for school lunches was giving me heart palpitations. ;) Thanks to your experiment, I’m going to be the best Mama in the world tomorrow when they find COOKIES in their lunches after 8 weeks without sugar. (Going to substitute stevia and xylitol so still no sugar.) THANK YOU!!! Can anyone tell me what “drippy” almond butter is? Do you just add water or what? Hey Janice, I just mean all-natural almond butter with no other ingredients. Hope this helps! These were AMAZING Angela! All my friends and family are asking for the recipe and I’m sending them to your website. It’s probably impossible to tell but do you know how many calories each cookie might be? I’ve even made them into bars and have them for breakfast sometimes so I would just like to know of I’m unknowingly consuming tons of calories. Haha thanks so much! I made the avocado pasta too (yummy) but put too much lemon in. I will keep making recipes from your site!! Thanks!!! it takes a bit of practice to match the ingredients, myfitnesspal will often match the first thing it finds rather than the best fit, so it takes a bit of experience to see where it goes wrong. if you notice crazy calorie statements it’s usually because it picked a flavoured food instead of a spice! When you make them as bars, how long to you bake it for? These sound amazing! I accidentally ordered way too much flax seed and have been looking for ways to use it up. I might add more in addition to the flax egg. Oh…my…word! These look incredible!!!! Can’t wait to make them. Maybe you could attempt an oil-free version…I mean, if you wanted reasons to whip up another batch and all ;). And, I have been absolutely loving the new display of your recipes. Very clean & modern looking. Well Done Eric!! Surprisingly yes, sesame can and does pose an allergy concern to many people. It is very closely related to peanuts, so many people who are allergic to one are advised to avoid both foods. Just a bit of insight :) These cookies look delicious, and I’m sure any nut-free, sesame-free version you were to come up with would be just as divine! Those cookies are full of so much goodness. I need to make them. I just made a vegan chocolate chip cookie last night and it was just ok. This looks much better. These seem so goood Angela! I love your new design of the recipe card by the way. It looks great :) Perfect for back to school snacks for kids! These look amazing! We have nut allergies in our house (including coconut) so I would love a nut-free version. Made your fudge- died and went to heaven! These looks insane! Insanely good! I support the nut free version because sometimes you feel like a nut, sometimes you don’t. Delicious! I am going to try these this weekend to have for afterschool snacks, now that school has started up again (aaah!). These look ridiculously awesome and delicious! Must. Make. Soon! Looks delicious. I’d probably try them with raisins and without the chocolate chips myself. Everything from the recipe down didn’t show up on the RSS feed. I use feedly. Hey Holly, I just noticed this myself and I added a note in the post. I think it has something to do with Wordpress not using short code (or so Eric tells me). Anyway, it will hopefully be fixed soon! I haven’t made cookies in ages, but that is about to change!!! I’ve never tried grinding oats into a flour – but I love the idea, it’s the best of both worlds! I love the texture of flour in a cookie & the flavor of oats. Can’t wait to hit up the bulk section for all those seeds! These look amazing! Totally drooling over here. Your dream cookie? Tested 4 times and placed in the vault? I’m sold! I love it when dessert is healthy and it looks as though you have mastered that with these cookies. I can’t wait to give them a try! Oh, and I love your gorgeous photography, as always. Going to have to make these asap! these look like the perfect snack to keep me going between work and grad school. And you’re site is getting so fancy–i love it! Recipe testing is the best! Trying to come up with the perfect recipe gives you such a good reason to indulge in a few extra cookies. Looks like you hit this one home! Those cookies turned out beautifully! 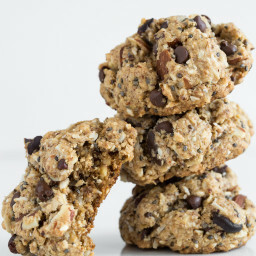 You had me at “chewy trail mix” cookie topped it off for me, these look and sounds delicious! The trail mix cookie recipe you posted a few years back remains as my favourite cookie; I will have to try these and see how they compare! Um YES to these!! I love the clean out the cupboard cookies, but also, they just look straight up GOOD! How damn delicious these look and they are healthy, too – win win! I will totally make them next week. Such a nice snack to bring to work or for some quick energy before a workout. Thank you, Angela! Yum! I would love a nut free version for my kids to take to school. Our school is no peanuts or tree nuts. Sesame and coconut are fine. Oh Angela! These look delightful !! Thanks for sharing! Yummy!!! These sound fab, Angela. I think I need to make a few (hundred) batches to get me through school this semester. Full-time student and a baby under one year old…you know I’ll need as many cookies as I can get my hands on! How pretty!!! These look delicious! Hey Angela, I never comment but I just had to leave you a note to tell that the photos in this post are GORGEOUS! I really like the white background. I’m just going to have to give them a try! I don’t know if anyone else has asked you this question, but can I replace almond meal/flour with another type of flour? These are one of my favourite deserts. I used a little bit of stevia instead of sugar and chopped almonds instead of sliced (made it harder to roll the balls) and chopped pecans instead of the sunflower + sesame seeds. It worked out great! I’m sooooo into these! Yum! These look super yummy! I loved that you threw everything into them! I bet they have such a rich and deep flavor with lots of different textures! I really can’t wait to try these!!! I had no chocolate chips or nibs but I had cacao powder. Made my own chips by modifying a “reboot with Joe” recipe. I mixed 1 T coconut oil, 2 T raw honey (I’m not vegan but you could use maple syrup if you are. ), 1 tsp vanilla and 1/2 cup cacao powder. I rolled into a thin layer between parchment sheets, froze for 30 minutes, then chopped into pieces. They were perfect in this cookie! Mine didn’t spread out, so I’ll add a little more water to the flax next time. But they taste divine. Even the kiddos and their friend from down the street loved them. 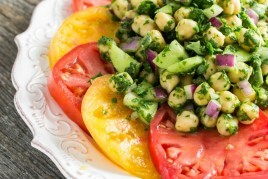 I’m not vegan, but love vegan food blogs because of healthy delicious recipes like this. Thanks again! love your subs- glad it worked out! yes coconut flour does tend to soak up a lot of liquid, so that’s a good idea to use less of it. Just made these. I had everything but the almond flour so I used buckwheat flour and added one Ener-G egg replacer as it was pretty dry. Only problem was I kept eating the batter as the first batch was in the oven! Oh, I put some dried cranberries in there too. Hopefully they will last until tomorrow so my husband and daughter can try them. Thanks for your recipe! What could I sub for the almond flour? More oat flour? A GF flour? Almond allergies. . .
Could anyone with experience in conversions let me know how to make a version of these with wheat flour? As a non gluten free broke college student it’s not realistic for me to buy almond flour, but these look so tasty I’d love to make them! Hi Hannah, I’m just taking a complete guess here but if using 100% whole wheat flour I would start with 1 cup – it tends to be more dense (and soak up more liquid) than almond flour or oat flour. If the dough is super sticky add more, a couple tablespoons at a time, until it resembles the batter in the picture. Hope this helps! let me know how it goes if you try it out. Ps. I didn’t have enough almonds to make the flour so I used 1/2 cup spelt- they turned out great Lisa, so any flour should work. hi angela, these sound great and i cant wait to try them! i was just wondering how many cookies the nutritional info is based off of? 23 cookies :) It should say that at the top of the nutritional info page. What a beautiful post! The photos are amazing. And I like the new recipe card format too! Yes, I would love a nut-free version of these…but I will make this version too. They look sooo good! Oh goodness. Next time I go camping, I’ll bring these cookies instead of a bag of regular trail mix. Gorgeous! Trail mix cookies are my favourite! These kind of remind me of the World Peace Cookies from Kelly’s Bake Shoppe, which are amazing (and it doesn’t help that I’m working there this summer… yeah I’ve eaten way too many of them lately!). these look delish! can’t wait to try them! Energy bites of any kind are my favorite and, like you say, are great to clean out the random bits of food in the cupboard! Looks so good! Question: I have a tin of already ground oats/oat flour. Would it still be one cup? Or does one cup of oats yield more once its ground? Does that make sense? I made these this evening with wheat flour instead of almond meal, walnuts instead of almonds (I didn’t have enough almonds :-( ), and pumpkin seeds instead of sesame. These were amazing! I was thrilled with how them came out. I feel like they would pull me out of an afternoon slump without the crash that desserts and carbs usually give me. My mom loved them too so I sent this page along to her. Thanks for such a great recipe. I will be making them again. I must make these. They look so good and I love the variety of nuts included! Just perfect! I would love a nut-free version!! I’m not properly allergic, but all kinds of nuts give me crazy stomach cramps and other issues, so I avoid them. Yum, I love baking that is full of nuts and seeds. It satisfies the carb and sugar cravings without the guilt. Will have to make these when I run out of my oat cookies. Many brands of dark chocolate are vegan – just check the label to make sure there are no dairy products added in. I buy Enjoy Life brand and Whole Foods semi sweet chips most often, but there are many others. I’d love a nut free version as well! 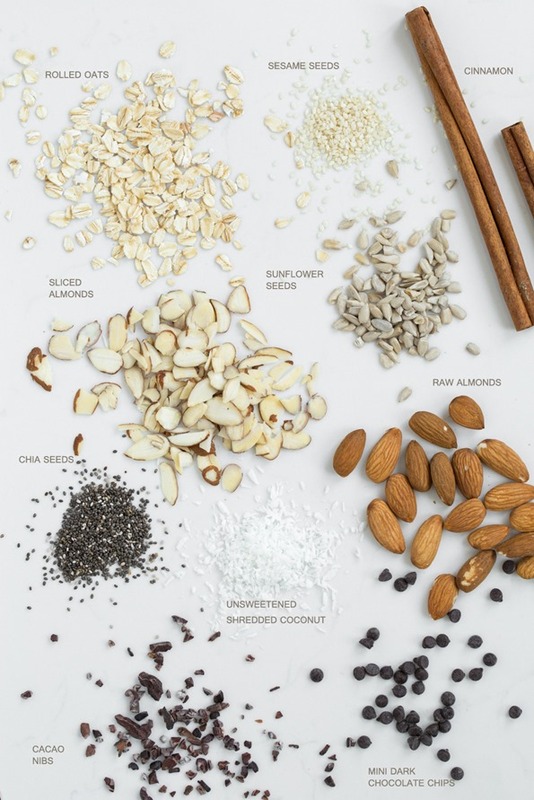 Coconut, almonds, sesame, and chia are all the worst for me! These are definitely deliciously “killer cookies”! Ha. These look so good!! But I am allergic to almonds. What could I use as a substitute for the almond meal? Coconut flour? Brown rice flour? Ok – gotta make these! They remind me of your other Trailmix cookies which our household loves. The kids call them healthy cookies. At first I dismissed the need for a nut free version – thinking only of myself of course :) but as you point out the kids could greatly benefit from a nut free version for school. Sesame butter is fine, as are seeds and coconut – just no nuts of any sort. what is the best way to make these sugar free? These cookies look delicious. I love having baked goods that have a little extra substance and healthy stuff in them. Love it, thanks for the recipe. I was so excited about these that I made them last night! They turned out great! They didn’t spread at all so I’ll tweak it for the next time. I loved that they are low sugar! These look soo good! 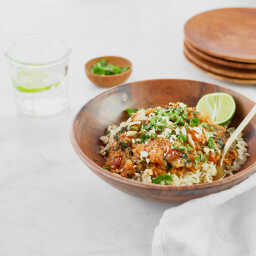 My husband and I love your blog–every recipe we’ve tried has been delicious! Seriously, you never steer us wrong. Thank you!! If you’re looking for a cookie challenge, I’d love to propose a version that’s GF and oat free, too? I know, I know, daunting! But my husband and daughter are GF with an oat sensitivity . . . and we’re vegan (for the most part), too. GF vegan is sometimes difficult in baking, especially without oats, so we don’t bake a lot. Anyway, just thought I’d throw that out there if you’re looking for another cookie challenge! :) Oh! And nuts are fine (phew! we need somethin we can eat! ;) Except our son is allergic to cashews and pistachios. It’s nice to see a cookie with some ingredients my body can actually use! These would be great for a road trip or after-school snack. This sounds like a great cookie. Right up my alley in cookie cravings. I do have a request: no sesame? I’ve developed an allergy and I’ve noticed a LOT of vegan recipes call for sesame seeds or sesame seed oil, which makes me sad. OR you could suggest a replacement seed (maybe flax?) let me know! :) Thank you so much! Please pretty please make a nut-free version. All of these healthy treats are inaccessible for my tree nut allergic child. Thanks!!! I think I remember one of your first posts having a basic chocolate chip recipe…look how far you have come. Amazingly creative recipe, gorgeous photos, beautiful blog, even yummier cookies. Love these, love the blog, love seeing everything you have created. Congratulations and thank you for creating something wonderful that you share with us daily. What a lovely comment Lizzie, I can’t thank you enough!! I just made these and they turned out fantastic. I subbed peanut butter for the almond butter because that’s what I had in the house. And since I don’t go near chocolate (migraines) I subbed currants. Thanks for the recipe. Nut free! Nut free! Nut free! Yes you little mind reader I would LOVE a nut free version! I am making these tomorrow to take to shakespeare in the park! I just bought flax seed for the first time and am excited to use it as an egg replacer. Should I just grind some of the seeds up to make the ground flax or is that a different product altogether? Mmmmm, these remind me of an “everything” cookie I used to make with oats, nuts, chocolate & coconut. They were delicious. I think I might need to try these as a healthier update! I would like a version without almonds, as I am highly intolerant to them. What could I replace the almond flour with? Hi, Angela! These look perfect. I have a similar millet based cookie that I make. Thanks for sharing such a scrumptious recipe! Your recipes are amazing! You might have answered this before, but can I just use Oat Flour instead of blending oats into flour? I am assuming yes – just writing this makes me feel a bit “duh”….but I guess my real question is would the quantity of flour required change? Would it still be 1 cup? Thanks! Keep up your amazing work! Any chance I could have a weight for the oats you made into flour? I have oat flour already made but don’t know how to get an equivalent. Do you think they would work if i used an actual egg instead of a flax egg? Also, what would you recommend instead of coconut oil? An allergy-friendly version of this cookie would be amazing! I recently found out about my intolerances to the major allergens like wheat, dairy, and eggs but also to Sesame Seeds, Almonds, and Coconut :( Boo, Me!!! I’m thinking you could use alternatives like pecans, sunflower seed butter, walnuts??? Yes please, nut free ones would be fabulous! Although these look yummy! I have a friend who is wheat and nut-free so it’d be nice to make her a treat that she can eat :) I’d love to see a nut-free version. These look absolutely incredible. Can’t wait to try them – love all the natural whole ingredients for texture and crunch. Would LOVE a nut-free, sesame-free version. My daughter has a severe allergy to tree nuts, peanuts and sesame… so we don’t even have them in the house. We’re always looking for nut-free versions of kids’ favorite snacks. They are hard to find! I cant wait to make theses! What could I use as a replacement for the ground flax seeds? Couldn’t resist trying this right away! Had to make lots of subs, but it came out really well. Hi, I made these and they are great!! thank you!! I subbed banana for most of the oil and maple syrup and it worked out well. definitely a keeper recipe! These look divine! They would probably be great with some dried berries as well. These are DELICIOUS! Also, I must add that the dough for these is likely the best cookie dough I’ve had (and safe to eat since it’s vegan!). I’ve already had my fill just with the dough. I made these to bring on a plane flight tomorrow for me and my family and I think they will be perfect! Hi Angela, this recipe looks fantastic! Do you how how much oat flour I should use if my oats are already ground up? I’m thinking probably less than the cup of oats before grinding… Thanks! I just made these and they are great! I did have one mishap – I forgot the almond flour! They are a little dry, but still taste good. . I’ll make them again…with the almond flour! So going to make these this weekend..
Now this is my kind of cookie! Especially considering that my two little daughters are ‘cookie monsters’ ! I love love love the idea of a rating system for recipes!!! I always try to wade through comments to get reviews on how it went when people made it, but it’s kind of pain. Oh my goodness. You had me at cacao nib. I can NOT wait to make these! i was trying gluten free for the last month and have loved your recipes. well, the doctor changed me to modified paleo so no sugar or grains or fruit. so, if you really need an excuse to keep making these or other cookies / treats/ snacks, i would love it. i can have everything but the oats , sugar, and maple syrup. any ideas would be great. Seeing those just made me crack open my afternoon chocolate brownie zbar! Must.Have.Chocolate.Now… I’d so like one with my morning tea! Can’t wait to try them this fall when the hectic summer season is over. yum! These look delicious! Just out of curiosity- have you tried freezing them, then eating them defrosted/thawed afterwards? I want to make my bridal party a healthy snack to put in their bags as part of their gift, and it would be perfect if I can make this ahead of time, freeze, and bag them up the Thursday to give to them on Friday…I just hope they have the same chewy-ness! Thanks ! I made a batch of these and put them all in the freezer. Then took a couple to work everyday. Works great. Wow, such yummy little cookies and healthy too – without the kids knowing ;) I love that! I just made these, with slight variations, and are soo good!! The shredded coconuts and coconut oil really made my house smell like a coconut paradise! These look really good! I like the idea another person had about using raisins! Question: I don’t have any natural peanut or almond butter at the moment.. do you think they would still be yummy if I used tahini? Or in worst-case-scenario, Kraft peanut butter? Made these tonight and LOVE them! So good, turned out perfectly. The dough was rather sticky and a little difficult to form the balls-the dough stuck to my hands a lot- but I got it done and it was well worth it! Probably a great idea to make a few batches and keep them stored in our house for the kids to snack on! Great alternative to the usual store-bought cookies with little nutritional value. Gosh, these look soooo yummy. As it’s the weekend….I think I might treat myself lol. Wow! These have just replaced your ultimate oatmeal raisin as my favorite cookies. So glad to be getting regular posts from you again. Quite a cookie. I made a batch last night, tested a few, and thought, “Not bad. Not bad at all.” Then magic happened overnight. I just tried one and could not believe the transformation. Last night’s good cookies have become great. They are crisp, chewy, chocolatey, crunchy. Just yummy. Thank you, Angela. Well done, indeed. These look fabulous! And I totally get your craving for wanting to make them again so I will support the nut-free recipe go, even if I’m totally fine with nuts myself ;). Always good to have options to pass on to clients with nut-free diets and I share your recipes with them ALL the time! 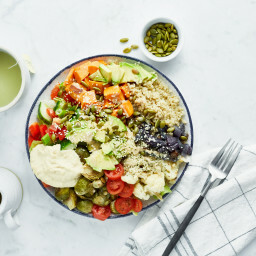 Hi, awesome website & recipes! I just recently learned that I am moderately allergic to wheat, corn, soy, walnuts, sesame, and peanuts… on top of horrible allergies to anything ‘green’. I’ve eaten all the above my whole life without any GI probs but I’ve always had asthma and ‘allergies’ so I’m hoping that if I cut down on the food allergens that maybe it’ll help with the respiratory issues? So yes, if you could create a sesame and nut free version, that would be fab! These are fantastic! 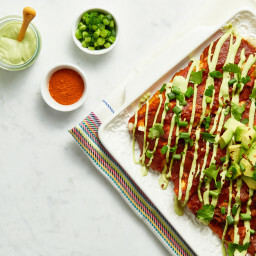 Just recently became vegan and your delicious recipies have made the transition so easy. i would love if you did a nut free version! my roommate has nut allergies and i am gluten-free and dairy-free. you can never go wrong with more jam packed chocolate chip cookies blog posts! Oatmeal chocolate chip cookies are the best!!! I love how thick these are and how many delicious ingredients you packed into them. Yummm. I just made these, subbed walnuts for almonds, sunflower seed butter for almond butter (it was nice and drippy- TJ’s brand) and doubled the chocolate chips- They are very good! A bit crumbly though, and definitely not chewy for me- I think I need to add more liquid next time maybe? I had a very hard time rolling them into balls and had to keep wetting my hands so that must have added some liquid though I’m not sure how much. I did 350 for 13 minutes plus 5 minutes on the pan before I transferred to a baking sheet as you suggested. I eat mostly raw but I made these today and they are seriously the best cookies I have ever had. thank you so much for the recipe. I don’t have coconut oil; would it be possible to sub in olive oil? Just made them. One word. Yuuumm!! Oh my gosh, these look almost too delicious! I think I’m heading to a grocery store to but some seeds. Would love love a nut-free version. These look amazing! I just made a batch of these and have already eaten quite a few. These are definitely going to be a go-to treat from now on! BTW for anyone who is interested, recipe changes I made were: subbed Trader Joe’s 70% chocolate bar in for the chocolate chips and cocoa nips, eliminated the chia seeds, swapped the coconut oil out for olive oil and almonds out for walnuts, and added dried cherries. I made these this morning and I can’t stop eating them!! Next time I will cut down on the sugar and add some currants or cranberries instead, but they’re so so close to perfect! Really excited to try a bit more cinnamon and spices for autumn – does anyone have thoughts about if the nut butter could be subbed with mashed banana or pumpkin purée? These are fantastic and a BIG hit with the hubby who’s trying to lose his wheat baby. I added dried cherries because I can never leave a recipe alone entirely. Very nice! Thanks. I’ll be making these again. These were some of the best cookies I have ever eaten! These were so great. My husband ate them for breakfast this morning when he was making coffee. Thanks for another great recipe. They are gone and I made them last night! My daughter and I made these today, using cashew butter. They are AMAZING. Thank you for the recipe! These taste wonderful, Angela! Great recipe. My son made them yesterday and they went so fast. He leaves for college soon and I will be making them to send to him this fall in a care package. Also, when he graduated in June we made your chocolate cupcakes for the party and everyone loved them. Thanks for all your great work. Hi Pam, Im so happy to hear this – thanks for letting me know! Yummmmmeeee. I am not a vegan, but like other posters, I follow your blog and others for these healthy delicious recipes. My total comfort cookie has been your almond thumbprint with raspberry jam (without the coconut). Now I will add this one too. Thank you. Angela, I just made these. Been craving crunchy–these were perfect! I made a few slight changes, and for half the dough, just for kicks and because I have a bunch, I added 1/2 cup shredded zucchini. These are so good! I’ll blog them soon and let you know. I’ll be giving all credit to you! The ones with zucchini are not crunchy, but still delicious. I made these almost to the T a few months ago! I added maca to mine & they were tasty! Tu for ur site, I love it! would you please either give the amount? or the gram weight? Made these today. I was full from already eating the batter! The real test was my chocoholic kid who loved them & can’t wait to show his friends at school. (They compete over coolest snack:). Bravo! Is there any way you could minimize the oil content? Maybe with unsweetened applesauce? Just wanted to get your opinion, this look incredible! I actually just tried this and I made two substitutions to come down on calories. 1- I did 1/8 c of maple syrup and 1/8 c agave nectar. For the oil I did 1/8 c coconut oil and 1/8 c applesauce. These were AWESOME! They aren’t too sweet, but just perfect! This will be a regular for me! I am allergic to coconut. What could be substituted? Yes nut free or at least Almond free! They look Amazing! Angela…what to do if they were much too dry instead of chewy? More water? More oil? More almond butter? Sooooo good though…even dry! Was the almond butter you used quite dry? I used a very drippy raw almond butter…so I would try adding more oil if yours is dry. Goodluck! We made these for the third time in a week. The entire family is addicted, including my mother, who normally says, “Yuck” to healthy recipes. Our daughter asked to learn how to make these, so she made them this time. She paced around the kitchen until her cookies were done. We used the stand mixer this time to blend the dry and wet ingredients together and it made it so much easier to blend. Thanks again for such a great recipe. Thank you for this versatile and delicious recipe, Angela! I love your blog and have read it for a long time. I adapted these cookies for our nut-free family with great success and thought I’d share what I did. Instead of almond flour, I ground 1/2 cup of raw sunflower seeds to flour (food processor did the job — did not need a Vitamix). In place of sliced almonds, I used 1/2 cup roasted, salted sunflower seeds. I used 1/2 cup mini chocolate chips and omitted the chia seed, sesame seed, cacao nibs, and extra sunflower seeds (next time I will use 1/4 cup chips and 1/4 cup currants, but I was all out). I used Sunbutter instead of almond butter and — since it was not “drippy” — increased the water in the flax egg to 3 tbsp. Let the batter sit for 20 minutes before rolling balls so the oats would absorb some of the moisture. I got 4 dozen cookies, baked for 12 minutes. Perfect! Kids love them. FYI, for any readers who want to try this and have never baked with Sunbutter before, the cookies will likely turn a little greenish after a day or so — this is a harmless chemical reaction among ingredients and doesn’t effect the taste at all. These are AMAZING! Just made a double batch…but I had ONE problem… A lot of the dough ended up in my MOUTH!! It was sooo good! Either way, raw or baked, this recipe is a WINNER! Thank you for your passion and love for real food! hah that happens to me all the time…I wonder if there is a cure? ;) Either way so glad you enjoyed them! I made these cookies today. They are great. Maybe the best cookies I ever had. Great recipe. Thanks. Hey Anna, yes I do think you could just leave it out without having to sub anything in its place. Let me know how it goes! Another delicious recipe and so easy!! Thank you so much! I’ve just made these and they’re still in the oven so haven’t tried them yet, but the dough is delectable! 12 minutes to go… COME ON!!! I made these just as is and they are perfect! I love that they’re decadent and healthy at the same time. Thanks for sharing! 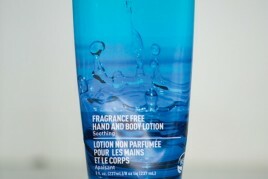 Is there anything to substitute for a liquid sweetener that would give moistness! I can’t use syrups, honey, agave etc. and I can sweeten naturally but need the moistness. OH MY GOSH!!!!! found your site by accident, so glad I did! 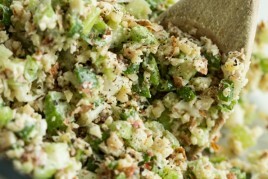 I am always looking for goody recipes that are good for you without all the sugar. The ways to use up seasonal foods are amazing too! My Husband has an autoimmune disorder so we have to be as fresh as possible, you have made my job a lot easier . you are on my favorites list, WHOO HOOO!!!! Hey Tammy, Usually pre-made oat flour equals the same amount of rolled oats ground into a flour. Dont you love when that happens? I just measured it the other week actually! so, 1 cup rolled oats should equal out to be 1 cup oat flour. hope this helps! Omg. Go make these now. Delicious. Nutrient-dense and super yummy. Thanks for all the great recipes, you are amazing! Hey Nat, hah yea that sounds like me around the cookies too! So happy you enjoy them so much :) They are a fav around here. Thanks for reading! These are the most delicious cookies! Next time I’ll have to make double! Yeah, I’ll also vote for a nut-free version. Sunbutter is pretty drippy, IMO, so I’d be tempted to try it with that. These are now my familiy’s official favorite cookies! The 2 runners up are also from your website (the raspberry jam thumbprints and the happy trails cookies). I follow the recipe except leave out the cacao nibs as my kids don’t like those. I guess they are an acquired taste. I just made these and they are soooo good! Irresistible indeed. Thanks so much for the recipe! These will make the perfect emergency snack for when I’m traveling. Hi I made these delicious cookies. Im not a great baker and I found when I made the cookies according to the recipe they would not bin and were very crumbly. I could not think what to do so I added an egg and they were perfect. Could anyone please advise what I could do. I think the issue was that my nut butter was not drippy enough but that was all I had and I am unsure how to make nut butter drippier. Any advice would be welcome. Do you think adding more flax/water would help or could I add some water/vegetable oil to the nut butter? These are delicious though and I want to make them again. I just made these and they are delicious!!!! Thank you!!! Have been making mine with oat flour & spelt flour. Made these and they are wonderful. Chewy, rich, just enough sweetness and satisfying. I didn’t have sesame or chai seeds but I didn’t miss them because these cookies are packed with so many yummy ingreds. I will make these again and again!! I used natural peanut butter for my drippy butter and it worked perfectly. I found the batter needed to bind more when I had all the ingreds mixed so I added water by the tablespoon until I could form balls. That worked great. I also found I had to push the balls down a little because they didn’t really flatten in the baking process. I love chocolate and pb so my cookies had that flavor and were soooo good!! Hi, can you suggest a good substitute for the coconut oil? Or do they really need it? They look amazing, but I’m avoiding coconut oil at present. Thanks! When I am looking for reviews, I am helped by those that have made it, not those who ave admired. I gave up after reading through many, many that had only admired. How helpful is that? I know what you mean! I’ve made them twice already and I can tell you they are AWESOME!! I didn’t have the cocoa nibs but I don’t think that mattered. I love these cookies! Any good substitute for the oil? I can have everything on the ingredient list except oil. I would live to try them! These are AWESOME!! Thanks so much for the recipe. I’ve made them twice already – they don’t last long around here! Hi! There are so many comments (that is amazing by the way) so I am not sure if someone already asked this, but is there anything I can used instead of coconut oil? i really hate everything about coconut (taste, texture, smell) and this is a major struggle when making vegan/raw desserts. Any tips are really appreciated. LOVE your site! Just made these and they were DELICIOUS! I didn’t have coconut oil, so I used 1/4 cup of applesauce instead, and they were still gooey and good. Thanks for the recipe! i have searching for a vegan, healthy cookie for a while, and this is exactly what i was hoping for! just made these this afternoon….used whole wheat flour instead of almond flour, but kept everything else the same. they are perfect. thank you!! These cookies are great! I’ve made them so many times and now I always make a double recipe. My family really likes them too and all of our friends that have tried them are asking for the recipe. I’m going to bring some for when I hike the Grand Canyon. They’re a winner. How do you make drippy almond butter? I made these the other day as a thank-you to a friend… and after I taste-tested both the batter and the freshly baked cookies I decided to bake a batch for myself. They definitely are irresistible! Thanks for the recipe! I love these cookies; can’t make them enough. I have added cranberries (as I can’t get enough of dried cranberries) and they were great.. Added a bit of zing. Thanks again Angela! These look amazingly delicious. Can you sub a chia seed “egg” for the flax seed egg? These cookies are delicious! I have a tray coming out of the oven right now. I made a few substitutions because I can’t have oats or chocolate – I used brown rice flour in place of the oat flour, puffed brown rice for the oatmeal, and dried cranberries and cherries for the chocolate chips and cacao nibs. I also used sunflower seed butter in place of almond (it’s what I had – and added a bit of extra water), honey for the maple syrup, and added some almond extract to amp up the cherry flavor. They are wonderful – thanks for the great recipe! I’m a huge fan of all your wonderful recipies, I must say these cookies are spectacular! Love the texture, the taste, the look, everything about it. Thank you for sharing your awsome recipes. Definitely looking forward to attempt to make all the other goodies in the near future. Could you use egg replacer in place of the ground flax + water? If so, how much would you use? I ask only cause I don’t have any flax seeds at the moment! Thanks. Yum! How important are the Cocoa Nibs to this recipe? I’ve got all the ingredients but those!! Tried this recipe recently…YUMMO!!!! Even my extreme picky eater loves them, yes!! Just want to say thank you for this incredible recipe <3 best cookies there are. I was sifting through your website to find a cookie that would be suitable for breakfast or a snack. This was literally exactly what I was looking for, and they are so delicious!!! Definitely will be making these over and over and load up my freezer! just discovered your blog…and OMG can’t wait to try so many things!! Thanks! Very good! Made them just as the recipe states and they turned out delicious. Will definetly be making them again soon! I made my very first batch of these cookies today. Although, mine did not end up chewy. A little drier and when bitten into crumbled. Any insight or suggestions for me for next time? I MUST try your no=bake protein bar as I have everything in my cupboard right now; except for the protein powder. Maybe I”ll add more nuts. But it sure looks tasty. My only question is, if this is kept in the freezer, what happens when it is taken to work and eaten 5 hours later? these are the best healthy cookies ever and one of the best cookies of all time! And I eat half of the dough before even baking them..which is at least 2 times per month! Thanks!! I grew up with cowboy cookies every week in my school lunchbox… and these are almost exactly what I remember, only grown-up! Amazing. They’re definitely going to end up in my treats rotation regularly. The only disappointment was that you shape your cookies the same size as I do – I can almost always count on getting another dozen on top of what the recipe says the yield will be, but not here!!! Haha. If that’s my only complaint, well, I guess it’s just a case of great minds think alike :) Thank you Angela! A weekly staple in our home. 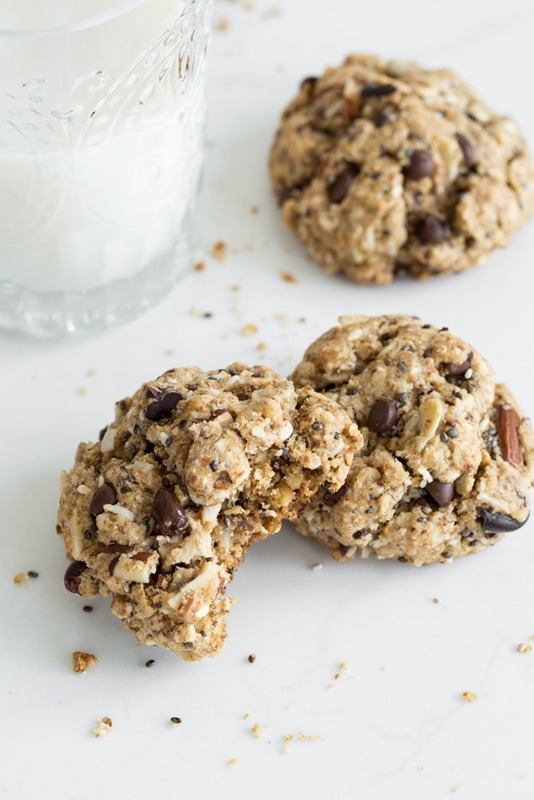 I love seeing my kids devour such a healthy alternative to my old chocolate chip cookies – I’ll never go back to traditional baking after finding your blog Angela! I loved these cookies, they are so good I actually had to make a second batch as soon as I finished the first one. Thank you for inspiring me with such delicious recipes!! To make it nut free, I substituted the almond meal for spelt flour and the sliced almonds for chocolate chips. Needless to say, they were a hit with my 3 and 5 year old, and the other kids at a play date. The ingredient list seems long, but they’re very easy to make. And substituted sun butter for the nut butter. These were so yummy! I tried a nut free version using sunflower seed butter, pumpkin seeds, flax seeds, hemp seeds, I used 1/2 ground buckwheat groats instead of almond meal. Even my husband who’s skeptically of baked vegan goodies loved these! I made these (without cacao nibs because I didn’t have any) and I’ve been eating them as a snack at work all week! They are the perfect afternoon pick-me-up snack. Thanks for the wonderful recipe! I just wanted to say thank you for creating this recipe. I made these cookies a while ago, and kept making them because people kept asking for them. They are the PERFECT cookie. I just noticed that now when I google “trail mix cookie” there are a few other sites posting variations of this cookie without crediting you. How sad. It’s one thing to make a variation of a recipe and make it their own, but if they’re publishing it they should at least give the recipe CREATOR a nod. Keep up the good work! I made these cookies for a friend’s birthday and they turned out really great! I did not make them gluten free, however, and skipped the cacoa nibs and chia seeds. I added a chopped up Hershey’s candy bar and loved the idea of the seeds and coconut. Very yummy and dense. YUM!! I tried these today, so perfect. Satisfied my cookie craving and will be eating these for breakfast all week. I also doubled the cinnamon and added dried cranberries. OK, I don’t bake but love the sound of these cookies, please tell me what flax egg is? These are amazing! Last time I made these was at the end of a long day of food prep and I got tired of forming balls, so I just pressed the remaining dough into a rimmed baking sheet. Turns out it makes great granola bars too! Now that’s the way I make them. But you have to make sure to cut them fresh out of the oven. 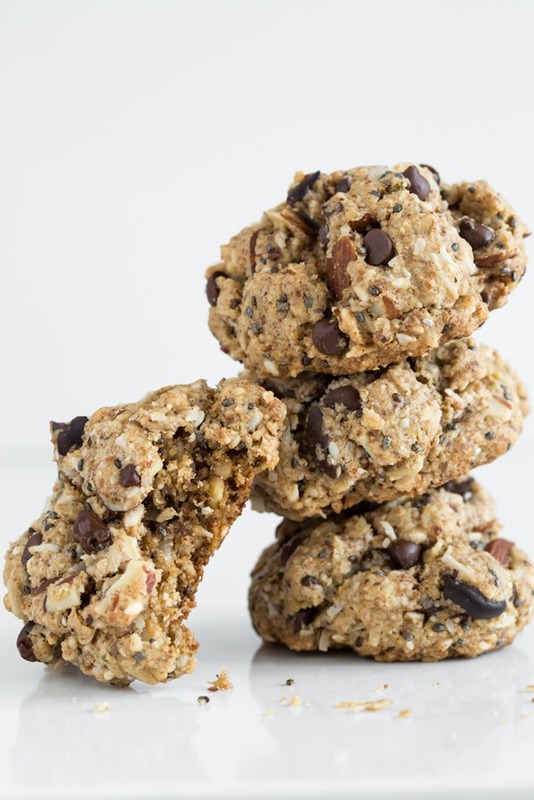 Great cookie that feels like you are indulging but they are healthy! I’m one of those people who never bothers to comment on things. However, these DESERVE a rave review. Seriously. I cannot say enough about how utterly amazing these are. I can’t believe they’re so healthy (simply from a taste point of view). I’ve tried many healthy “dessert” recipes that don’t deserve a second glance. People are usually trying too hard (and failing, from the opinion of a sweets-lover). These cookies will change your life though. I’ve made them with honey instead of maple syrup, and pumpkin seeds rather than sunflower seeds (just what I had on hand). They’re truly irresistible. Just took these out of the oven and tried my first one -OMG!! I’ve been baking gluten free for years and these cookies are just the right texture – nobody would know they were GF if you didn’t tell them – and so chock full of goodness – Yumm!!! 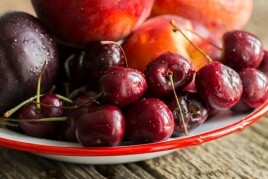 So glad I found your blog – will continue to try your wonderful recipes – thank you!!! Yummy and filling! I can’t believe how much “healthy stuff” is stuffed into here! 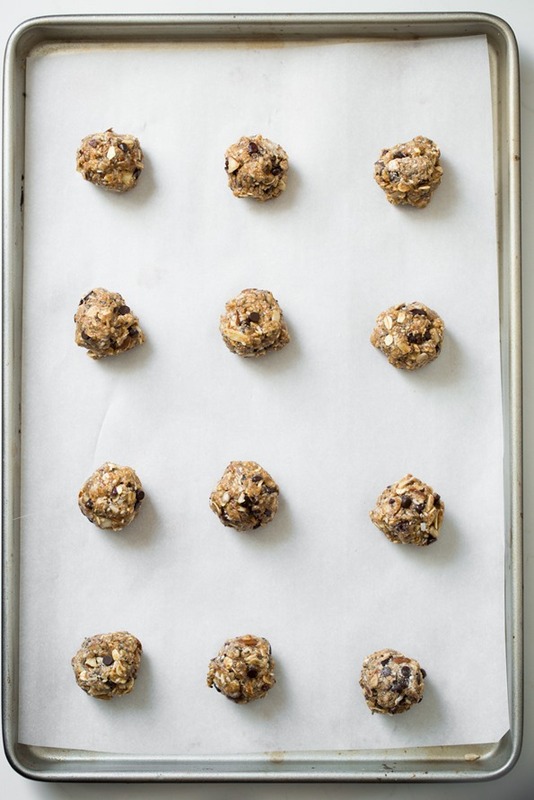 NOTE: If using a baking mat instead of parchment paper, the cookies do not spread out, rather, they remain in balls. I just gave em a quick pat down when I saw this and they were fine. THESE HAVE OATS IN THEM. THEY ARE THEREFORE NOT GLUTEN FREE! Please be careful with what you post. As a longstanding coeliac, oats ALWAYS make me ill! For the new coeliac, this could be very deceptive and borders on irresponsible! Theese look soooo god. I’m wondering if i can substitute the coconut with anything. Olive or canola mabye? Would that work? Why/what is the flax meal and water for/do? These are like heaven in a cookie! 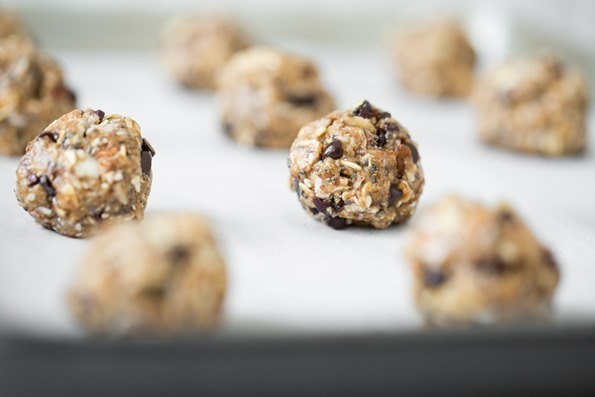 They are definitely among my top 5 cookie recipes and they are packed with nutrients! It’s a win-win! I made these cookies last night – just as the recipe was written – except I left out the cacao nibs as I didn’t have any. They turned out great! I loved them and so did my kids! Thank you. I forgot to rate the recipe – so here is my rating. I’m giving it 5 stars as it is one of the best “healthy” cookie recipes I’ve ever tried. I have been looking for a trail mix cookie recipe for a while now, and these were great! I’m not a big chocolate fan, so I subbed raisins for the chocolate chips and goji berries for the cacao nips, which was perfect. They are a little too sweet for my taste, so next time I’ll cut out some of the coconut sugar and/or maple syrup. But will definitely make again – they make great little portable power snacks for hikes, traveling, or even a long day at work. Maybe tahini instead of almond butter? I don’t know if seeds are safe when nut allergies are involved. These look fantastic! I need a nut-free version because we have allergies (all nuts) at our house. I also saw someone mention this, but I wanted to confirm that sesame seeds set off a lot of people (like me) who are allergic to peanuts. Thanks so much for coming up with creative, yummy recipes for all! Tried this recipe and loved it! Finally a gluten free, egg free, dairy free cookie that actually still resembles a crunchy, delicious cookie. Thank you! This will be on our fave list. I made these last night, I ran out of almonds so I used a mix of pecans and macadamia nuts – they were SO delicious!! Bravo…these are yummy! I made them as directed, using coconut sugar. I didn’t have shredded coconut, so used the flaked (pulsed in blender a couple of times). Although they were very satisfying, I’d like just a tad bit more sweetness, so I might try brown sugar next time (which, measure for measure, always seems a bit richer to me) and a tad more spice. There WILL be a next time for these wonderful little nuggets! Tip..mix these with your hands. When forming, I found it much easier to wet my hands every few cookies when forming. These are in the oven as I type … and if the baked cookie is half as good as the batter … it will be a new favourite! Mmmmm, cookie batter!<3 I hope you enjoy the baked version just as much, Amy. Wonderful! I think they’re actually better after sitting in the fridge for a day or more. The perfect side to my bedtime Chia Tea Latte. Am also loving your cookbook!! These are my new favourite! I used a chia egg, added cranberries, and skipped the sesame seeds and they turned out awesome. Wonderful to hear they were a hit, Sid! Just made this and they are delicious! Wonderful recipe, thank you! Thank you for this amazing recipe! I had to improvise a bit. I used sunflower seeds in place of almonds and hazelnut spread with cocoa instead of peanut butter (allergies). They turned out so yummy. We had our preschool’s May Faire and they were a huge hit :) Thanks again and Happy MOther’s Day to all the mamas out there! These are PHENOMENAL, Angela! Implementing what I already have on hand, I used walnut flour instead of almond flour, half all natural peanut butter and half runny tahini for the almond butter, subbed some pepitas for the slivered almonds, and on a whim decided to try half Earth Balance and half coconut oil in place of solely coconut oil. Also, I only had regular size chocolate chips so in they went! These are my kind of cookies through and through. Thank you so much for the amazing, delicious recipe. Blessings! I love your tweaks Kerri, I’ll have to try that. It’s been ages since I made these! So happy you love them. Rosemary, I love the tweaks that you made to the cookie…I’ll have to try those next time. So happy you love them so much! Very tasty but a bit dry?? I doubled up to make lots for my hungry bunch and I find them very dry. I did it exactly as per recipe!! LOVE the flavour just dry and crumbly.?? We would love a nut free version. Even in Grade 8 they cannot bring any nuts into the school. Sesame seeds, sunflower and pumpkin seeds are all ok. Thanks for this recipe I can’t wait to try them!! Thank you Diane! I’m going to be sharing a new nut-free cookie recipe this week on my blog, so keep your eyes peeled. :) You may want to check out the nut-free options for my Flourless Peanut Butter Cookies in Oh She Glows Every Day (p. 213) and Crispy Almond Butter Chocolate Chip Cookies in The Oh She Glows Cookbook (p. 265) too! You can find nut-free swaps in the Tips sections. Dream Cookie!!!! I’ve made a bunch of your cookies (and other vegan, gluten-free cookies) but my husband ALWAYS wants this one (which is great since it’s one of the healthier ones). It’s a pleasure to make these too since I steal pinches of pre-baked batter….OMG! !